A demonstration against mobile shutdowns in North Sinai. 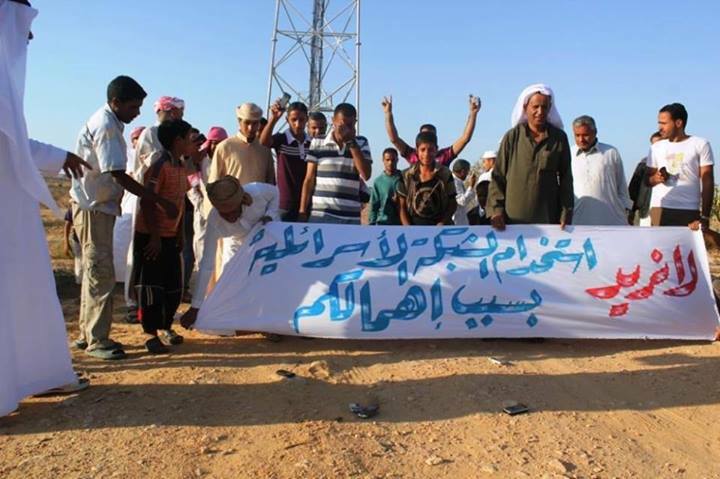 Banner reads: “We don't want to use Israeli networks because of your neglect.” Photo by Sinai2014/SinaiOutofCoverage group page. This post was written by Asser Khattab and originally published on the SMEX blog. It is republished on Global Voices as part of a content-sharing agreement. As part of a military operation to root out “terrorists and criminal elements and organizations” from Egypt's Sinai Peninsula and adjacent areas, the Egyptian Armed Forces have ordered a region-wide shutdown of internet and telecommunications services. Dubbed “Comprehensive Operation: Sinai 2018,” the military campaign is targeting insurgents affiliated with ISIS in the northern and central areas of the Sinai Peninsula, west of the Nile valley, and the Nile Delta. Online activists and Egyptian citizens are sounding the alarm on Twitter using the hashtag #سيناء_خارج_التغطية [“Sinai is out of the coverage area”] to express concern over the fate of Sinai civilians, which is largely unknown since they are now both physically and virtually inaccessible. Since July 2013, Northern Sinai has been treated as a closed military zone by Egyptian authorities, who have banned access to journalists and human rights observers. Thousands have been forcibly evicted and displaced as the Egyptian military bulldozed homes to create buffer zones on the border with Gaza, and most recently around the Sinai airport. This major military campaign has effectively placed the Sinai in a media blackout, with telecommunications shutdowns disconnecting Sinai residents from each other and isolating them from the rest of the country and world. Such shutdowns have become commonplace for residents of Al-Arish and other cities in the sparsely populated North Sinai, who are subjected to network disruptions “whenever military and security operations are conducted in the desert area south of the city,” according to an engineer from al-Arish who spoke to SMEX on the condition of anonymity, fearing that he could be summoned by the authorities. The source added that the government does not warn residents before a shutdown and does not provide any justifications once services are restored. The Egyptian government has been launching offensives against the Sinai insurgency since it began in 2011, in the aftermath of the Egyptian revolution that toppled the presidency of Hosni Mubarak. Extremist militant group Ansar Beit al-Maqdis (ABM) repeatedly attacked Egyptian security forces before pledging allegiance to the self-proclaimed Islamic State in the Sinai Peninsula, known as ISIL-Sinai Province. 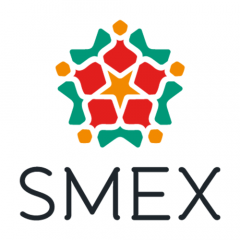 Mohannad Sabry, a journalist and researcher who has extensively covered the Sinai, told SMEX in a phone interview that internet and telecommunications blackouts are simply ineffective. “Government forces suffer from network disruptions more than the insurgents,” he said, referring to instances when ground forces lost contact with each other or with the Ministry of Interior during combat. Insurgent groups “have alternative ways to communicate, like through BGAN portable terminals and shortwave walkie talkies,” Sabry added, explaining that disruptions to telecommunications services have little impact on their alleged targets. These shutdowns prevent local and foreign journalists and non-governmental organizations from reaching sources on the ground. “Limiting coverage of the failure of Egypt’s strategy in the Sinai and of the negative impact it has had on the community there is one of the reasons behind these disruptions,” Sabry said. On February 3, The New York Times exposed a “secret alliance” between Egypt and Israel in the war against militants in North Sinai. The Egyptian government is trying to conceal such information from the public, according to Sabry, “Egyptian leaders wanted to cover up the approval of Israeli airstrikes on Islamic State positions in Sinai,” he said. The telecommunications sector in Egypt is operated by the National Telecommunications Regulatory Authority (NTRA), which “means that this body is implicated in any network disruptions that occur in the country,” a freedom of expression activist told SMEX on the condition of anonymity, as a safety precaution. “Various government bodies interfere in the work of the NTRA, including the Ministry of Defense, the Ministry of Interior, the National Security Agency, and others like the Ministry of Telecommunications,” the activist added. The recurring interference in internet and telecommunication services comes as press freedoms and freedom of expression are jeopardized by the military rule of President Abdel Fattah El-Sisi. In 2016, Egypt was the world’s third-ranked offender in terms of imprisoned journalists, according to the Committee to Protect Journalists. “Several women were unable to call an ambulance while in labor,” he added. For residents like our source in Al-Arish, who are directly impacted by these shutdowns, “the worst aspect is the element of surprise.” Some residents have been unable to learn about a relative’s death, learning of it 10 to 12 hours after its occurrence. Others have had to travel long distances, as much as 90 kilometres, to simply make a phone call or send an email. Hindering and limiting access to information and communications services is a national concern in Egypt that extends far beyond the Sinai Peninsula. Since May 24, 2017, the Egyptian government has blocked at least 496 websites, according to the Association of Freedom of Thought and Expression, an independent legal firm. Websites of several international news outlets, such as The Washington Post, and independent local media outlets, such as Mada Masr, are blocked. Under the pretext of supporting terrorism or the catch-all “fake news,” the Egyptian public is being deprived of essential services and information while the work of local journalists is coming under systematic attack.